This is the more common type encountered. It is almost identical to the Type 91, except that it has no provision for a base propellant attachment and has a shorter fuze delay time, 4-5 sec. 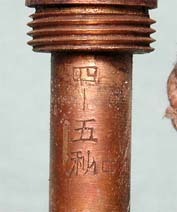 No observed cast markings in the body as with the Type 91. Paper labels appear on the base as well as ink-stamped fill dates. 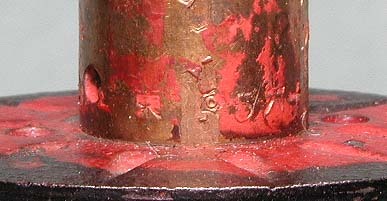 The red painted tops vary in amount of coverage. 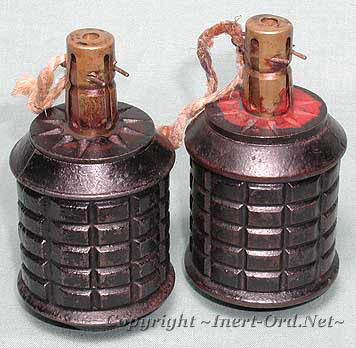 The fuze assembly for the Types 97 & 91 consist of a fuze housing with detonator, (much like a rifle cartridge), creep spring, firing pin assembly, retaining cap, and safety pin. The firing pin is recessed in the striker cap, and needs to be screwed into position to arm the fuze. Once the fuze is armed, the safety pin is removed, (the indents in the retaining cap holding the assembly together), then the head of the fuze is struck against a suitably hard object, firing the primer and igniting the delay train. At right you can see into the fuze head. 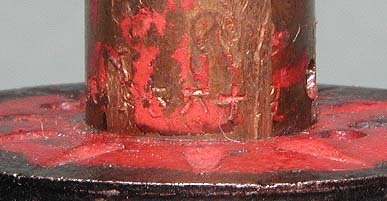 While the primer is gone (typical for interted grenades) the anvil and gas ports are still visible. The firing pin shown seated in its "armed" position. 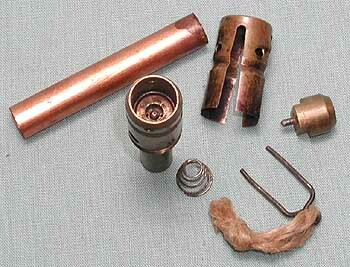 The copper fuze well tube contained the detonator. The fuze stem contains the delay element. 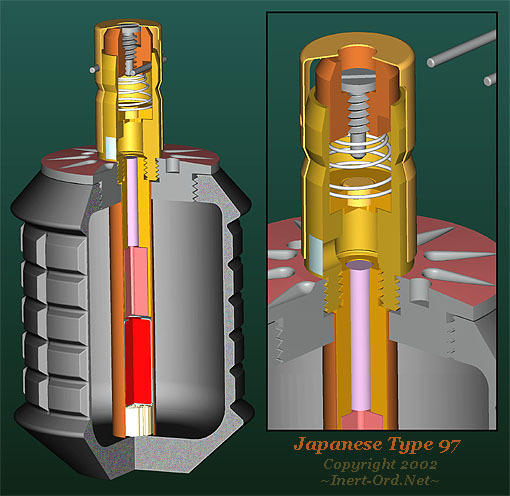 Placed at the bottom of the fuze well is the detonator (red capsule) seated on a soft packing wad, either felt or paper. The delay element in contained in the fuze stem above, which is screwed into the main fuze body. There is a gas vent hole covered by a foil weather seal. The fuze assembly is inserted and screwed in place from the top. The grenade was armed by first screwing the firing pin down, so that it protrudes from the base of the striker. The safety pin is pulled. 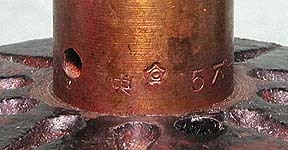 A sharp blow to the top of the fuze would overcome the creep spring and crush the thin brass cap allowing the pin to hit the primer and initiate the delay element. The fuze stem containing the delay common to both examples. 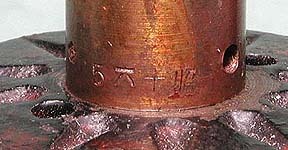 The markings indicate delay time for the fuze. Read as "4 - 5 seconds".